Are you embarrassed by your front teeth? Maybe it’s just moderate defects—a chipped tooth here, an irregularly shaped tooth there—but it’s enough to make you less confident to smile. There are a number of ways to transform your teeth’s appearance like porcelain veneers or crowns. But a relatively inexpensive method that’s less involved is to bond dental material called composite resin to your teeth to correct defects. Made of synthetic resins, these restorative materials can mimic your own natural tooth color. We can also artistically shape them to create a more natural look for an irregular tooth. If you’re looking to change the way your front teeth look, here are 3 reasons to consider composite resins to restore them. They can be applied in one office visit. Although effective, veneers, crowns and similar restorations are typically outsourced to dental labs for custom fabrication. While the results can be stunning, the process itself can take weeks. By contrast, we can colorize, bond and shape composite resins to your teeth in just one visit: you could gain your “new smile” in just one day. They don’t require extensive tooth alteration. Many restorations often require tooth structure removal to adequately accommodate them, which can permanently alter the tooth. 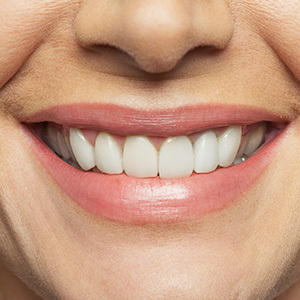 Thanks to the bonding techniques used with composite resins, we can preserve much more of the existing tooth while still achieving a high degree of artistry and lifelikeness. Composite resins are stronger than ever. Over the years we’ve learned a lot about how teeth interact with each other to produce the forces occurring during chewing and biting. This knowledge has contributed greatly to the ongoing development of dental materials. As a result, today’s composite resins are better able to handle normal biting forces and last longer than those first developed a few decades ago. Composite resins may not be suitable for major cosmetic dental problems, but you might still be surprised by their range. To learn if composite resins could benefit your situation—even a large defect—see us for a complete examination.